It seems like many of the beers we brew are here for a minute, then gone. You need Steve Martin-esque timing in order to catch your favorites. Half of that is because we’re big fans of seasonals down here — they keep our lives interesting. The other half is that our seasonals are so popular, they tend to sell out rather quickly. We know it can get confusing, dear beer drinker, and we never want to let you down. With that in mind, we’ve made a decision. We’re adding another year-round offering to our lineup, and we think you’re going to be relatively pleased with this development. Our Tide Table Pale Ale is going to be your new go-to when you’re down to the brewery. We’ve always toyed with the idea of a year-round brew with a low-to-mid ABV and a strong hops presence, and we’ve had a few successes along those lines. 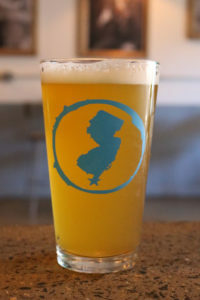 Cape May Pale Ale, Smooth Sail, Escape the Cape, Sea Mistress, and the like have been well-received, but by the time they were gone, we’re excited to move on to the next one. Tide Table, on the other hand, we’re pumped to do year-round. And it looks like these guys knocked this one out of the park. It’s got a really intense flavor, with a great hop aroma of pine, orange peel, mango, papaya, and just a touch of that resinous dank that we all love so well. The malt profile has a hint of the German Caramunich malt. We used almost a pound-and-a-half of hops per barrel, which in a 5.2% pale ale with a medium-light body is an absurd amount of hops. This brew jumps right out of the glass and onto your palate. We’re certain you’ll agree, deer beer drinker, but there’s only one way to find out. Swing down to the brewery this weekend and let us know what you think!